Visual learners easily receive information through their sense of sight. What they see leaves an image impressed upon their brain that makes it easier for them to recall later. When information is visually organized, students are much more successful in the classroom. Visual learners reproduce information best through demonstration. 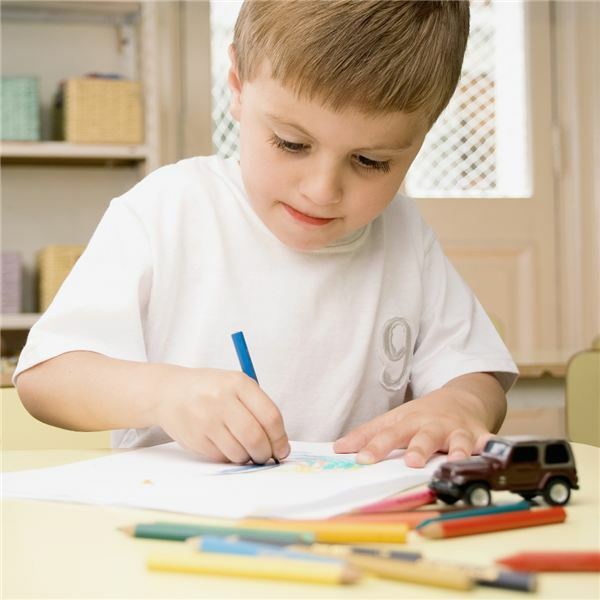 They can easily express themselves in writing or through drawing. Information the students have seen is often reproduced in the exact manner in which it was portrayed to them. They perceive the world through their eyes. They feel what they see. They enjoy writing or drawing. They enjoy taking notes with different colored pens. They include drawings or diagrams to help them understand concepts in their notes. They respond best to written directions or by watching the teacher carry out an activity. They usually have neat handwriting. They usually need their workspace clean and organized to work. They usually do not have difficulty maintaining eye contact when spoken to. They enjoy presenting information using a poster or PowerPoint presentation as a guide. When teaching visual learners, always make sure that the room in which the child is working has the correct amount of light. Also, eye contact must precede physical contact. These students understand feelings and emotions as they observe others. When the student arrives at school, be sure to have visual references for the student so that he or she can organize himself/herself. Give students instructions using gestures and facial expressions. Play games such as Monopoly or Guess Who that have been adapted to the study material (Social Studies, Science, English, etc.). Typically, visual learners do better when working in an organized environment, in which everything they need is easily found. Teach the child to keep his/her things (notes, necessary materials) in sight and not within their desk in order to stimulate their memory. Help the child organize himself/herself, prioritize work, and establish a work plan by creating his/her own agenda, graphic organizer, or diagram as a visual reminder of what needs to be done. When giving a writing assignment, use charts with color keys to organize ideas and highlight the kind of writing that they students should be using (comparison, description, etc.). No matter what subject you’re teaching, encourage the student to write. Permit him/her to organize thoughts so as to communicate better. To facilitate this, you may want to suggest using diagrams, drawing the significance, using Scrabble letters, or creating shapes with clay or paper cut-outs. To help build reading comprehension, ask the student to read the material and draw a picture to summarize it. When asking questions, give the child time to think and form mental images. Don’t just answer their questions, help them discover the answer. Help the student highlight key words and have him or her draw them. Use drawings or markings to aide in comprehension and analysis of the content and to help the student pay attention. While students are reading, in each paragraph ask them to imagine what is happening as if it were a movie. When introducing a new math concept, model the idea for the student in writing and give concrete and tangible examples for activities and math operations. Create a sequence of drawings to define the steps to follow or procedure for completing a math problem. Show the student how to do something and how it functions when giving instructions. But, keep in mind that the student doesn’t always need to be told how to do something unless he/she asks because this can confuse them in the process. Have the student give a presentation to the class. When presenting, allow the student to look at his/her notes to help remember and to concentrate on what he/she should say. Watch a movie. Analyze the characters, setting and theme. Ask the students to write a similar story but one that changes the beginning, end, and characters. Ask children to draw a comic strip. Or, provide a drawing with blank areas for them to write their own dialog. Study for spelling tests using cards to help the student identify the form and appearance of each word. Ask him/her to write the words using a color key for the parts that they are having trouble memorizing. When you are explaining a new or abstract concept, use images or concrete examples to help the student retain the information. Create note cards with vocabulary or concepts on them and include a picture of the concept. Use a color code for paragraphs to help students recognize the main idea, the secondary ideas or any derived ideas. Use color codes on symbols or on the orders of mathematic operations to help students solve problems. Finally, be creative! Visual students are always watching and appreciate any visual stimulation that gets their brain moving.